Meet Danielle: she has been with us for almost two years as a Museum Educator. Danielle brings an enormous amount of enthusiasm and curiosity to the position, and we’re thankful to have her here even after she graduated from UIC. Look for Danielle in the museum on Tuesdays and Thursdays and be sure to say hello! 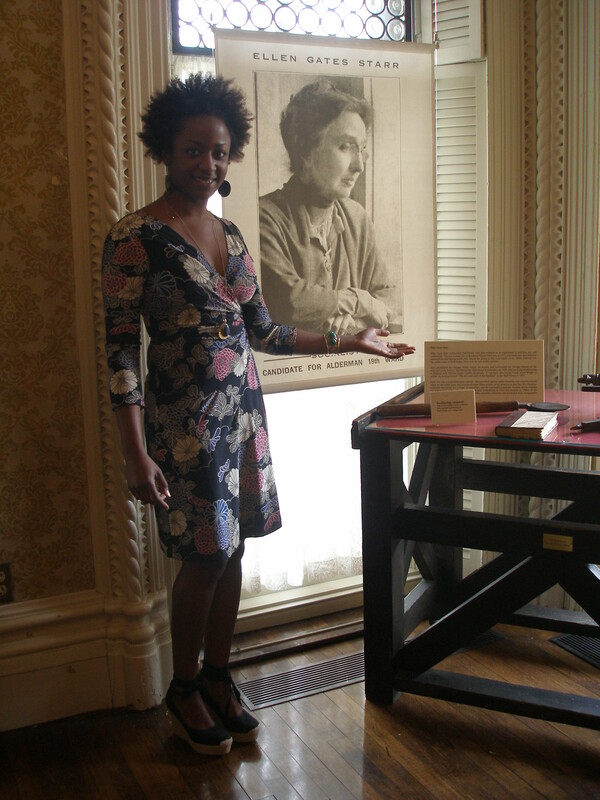 What is it like to be a museum educator at the Hull-House Museum? I love working as a museum educator at the Hull-House Museum! As an advocate for social change, it is an honor to be so closely connected to the institution that began so much of the dialogue around social change/social justice that we continue to engage in today. It is an honor to work alongside others that are so passionate about social change as well. Working at the Hull-House Museum has enriched my life in so many ways, especially because I get the opportunity to think critically about social change every day. I enjoy interacting with visitors and engaging the public in dialogue regarding critical social issues such as immigration, democracy, diversity, peace and equality. What do you like about this work and what are the challenges? The work that I do here ties in perfectly with my background in Urban and Public Affairs and Gender and Women’s Studies. I enjoy being a part of a social change museum and interacting with the diverse visitors that the museum attracts. It is also exciting to work in a museum that tackles such a rich, complex history. There is always more to learn and research and new information about Hull-House history is discovered every day. I believe that educating others about social issues through Hull-House history contributes to social change and keeps the Hull-House mission alive. The biggest challenges to being a museum educator are finding the most effective way to convey and illustrate complex concepts and adapting the information to make it relevant to every audience. Each tour group and each visitor is different. Fostering dialogue around these issues can be both challenging and rewarding. It is rewarding to feel that a tour group or visitor may leave the museum thinking more critically about social change as a result of something that you said during a tour. Any memorable encounters with the public? Working at the museum has provided me with many memorable experiences including my first experiences in youth education. My most memorable encounters have been working with younger student groups, because they are often more participatory during tours, they usually have genuine responses to my questions and there is just something so special about engaging future generations in dialogue around social change. That’s a tough one! If I HAD to choose I think that my favorite artifact would be Ellen Gates Starr’s bookbinding tools, because they give me the opportunity to talk about the connection between art and democracy, a fascinating topic that I wish more people were aware of and discussed more often. What do you do when you aren’t hard at work at the museum? When I’m not hard at work at the museum I love to read, paint, practice yoga, and dance to live music! If you were a Hull-House resident, who would you be? Ellen Gates Starr, because I identify with her radical approach to social change including her socialist political views, her belief that art is essential to fostering a democratic society, and her community organizing efforts. In the future, I see myself continuing to be an advocate for social change. My experience at Hull-House has helped me to realize just how much I enjoy educating others! Today’s featured staff member is Amanda, who has been here longer than almost all of us! Amanda began her work at the museum as a docent while she was a UIC student studying Art History. She returned to us later as an education staff member, and thank goodness for that– she knows Hull-House history like the back of her hand and can wrangle a rowdy school group like no other. Anna is one of the smiling faces you'll meet here! 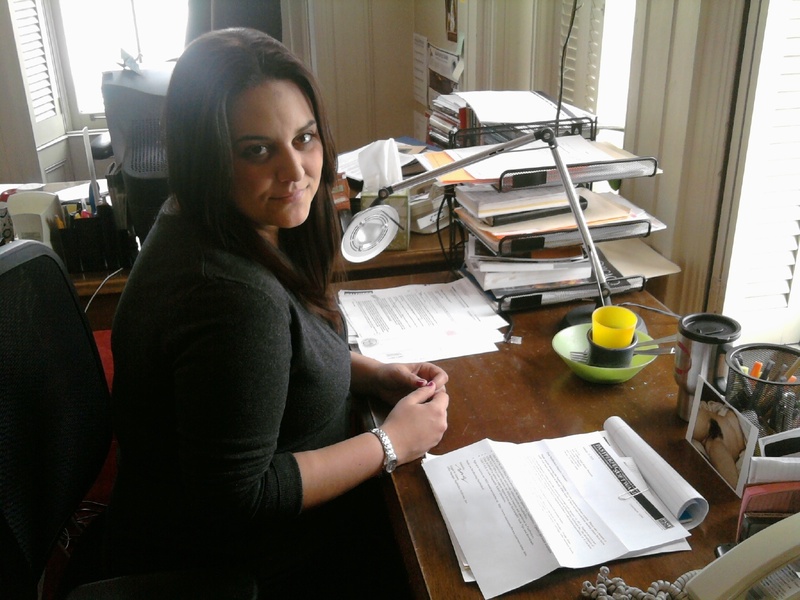 Meet Anna, who works at the Hull-House Museum as a graduate assistant and museum educator. Trained as an art historian, Anna has easily moved into the position of an educator at a public history site. In this position, she is tasked with learning the history of the Hull-House Settlement and conveying this information to just about everyone- from curious second graders, to wandering tourists, to professional social workers. We’ve been so happy to have her here! And, check out Anna’s earlier post about our staff visit to the Art Institute. It’s time for another addition of “Meet the Staff.” Today, meet Michael, or Mike as he is often known. 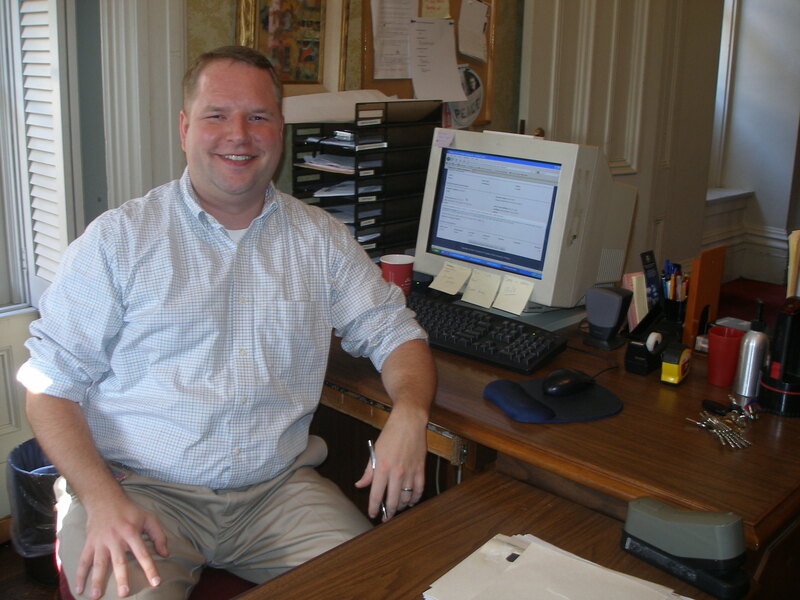 Mike was a welcome addition to the museum staff earlier this fall and increased our number of male employees by 100%. This is our second edition of Meet the Staff, and I’m pleased to introduce the lovely Kelly! 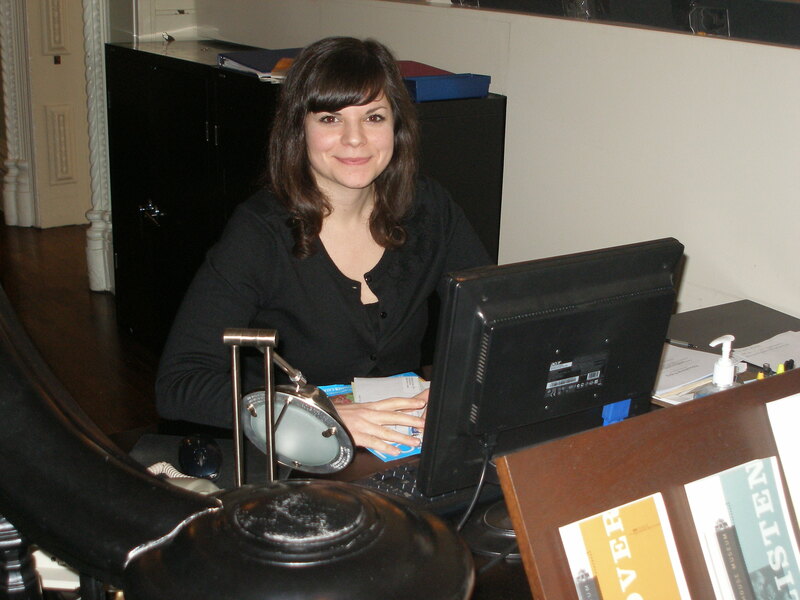 Kelly has been at the museum for over a year, and she brings great organizational skills, creativity, and enthusiasm. How would you describe your work at the Hull-House Museum? My work primarily involves the planning, coordinating, and managing of the Hull-House Museum’s public programs. I also assist in coordinating the events of our programming partners that take place at the Museum. Very recently, my responsibilities expanded to being the Volunteer Coordinator for the Re-Thinking Soup program and the Museum’s Urban Farm and Community Garden Project. I am very excited about this, as Re-Thinking Soup is one of my favorite core programs of the Hull-House Museum. The other part of my job involves being the Special Assistant to the Director, Lisa Lee, and assisting her in coordinating her personal events and activities in various political, cultural, and social arenas. What are you currently working on at Hull-House? Hmmm…what am I NOT working on at Hull-House is more of the question. Well, right now, I am working on organizing volunteers for Re-Thinking Soup and making sure we meet our deadline for the interim narrative report for the NEH grant! I enjoy the people: my colleagues, programming partners, and staff in other UIC departments. I also enjoy good and creative public programming and using my energies to bring ideas to the table and people together. It’s very rewarding to see it all come together. I also like the variety of things I get to do on occasion, which keeps things a little interesting. The pace can get pretty hectic at the Hull-House, so you just have to hang in there with the ebb and flow of it all. Also, there are always interesting and creative brainstorming sessions going on, which is a good thing. However, I work in an open office space, so it’s difficult to completely remove myself from the impromptu discussions. Sometimes, I want to have an imaginary wall that is impenetrable, so I can block myself off. I have to be really disciplined at times and resist wanting to jump in on every yummy conversation! Name a previous experience that has helped to prepare you for this work. Before coming to the Hull-House, I worked at an Institute at Columbia College Chicago that did a lot of public programming. I was involved in much of the planning and coordinating and developed a lot of relationships with people from different departments on campus as well as community partners from different cultural, social, and civic organizations. The work I did there definitely prepared me for my current position at the Hull-House Museum. My favorite artifact in the Museum is Jane Addams dress. It’s a bit surreal to know that this is a dress this amazing and world-renowned woman wore; that her skin actually touched this dress is really something. What do you do when you aren’t hard at work? When I am not at the Museum, I am most likely doing two things 1) working with Affinity Community Services, where I serve as Vice President of the Board of Directors (I just got voted in on Saturday. Yay!). We are a non-profit organization founded on the South Side of Chicago that provides advocacy, services, programming, and leadership development for Black lesbian, bisexual, and transgender women. 2) Sharing a meal and enjoying spending time with my partner, my favorite thing to do. What is your all-time favorite museum? I don’t have an all-time favorite museum. However, I love the Museum of Science and Industry and enjoy visiting the Field Museum and the National Museum of Mexican Art. I was in San Francisco about a month ago and visited the GLBT Historical Society in the Castro neighborhood. It is a small and very modest museum but is an example of one that uses the artifacts they have well. The exhibit there that moved me the most is of the suit and shoes Harvey Milk was wearing when he was killed. To see the fabric, to look at the shoes and know that his feet were in them, and to see the blood stains on parts of the clothing was really compelling. I was not expecting to see an exhibit like that, especially at such a modest museum. It was very powerful and sobering and really reminded me of all the history that took place in the Castro. It brought that history to life for me in that moment even more. I would be Mary Rozet Smith. From what I know of her, she was an accomplished and civically engaged woman in her own right that put her money and resources where her mouth was. She was a quiet force that does not get the attention and glory that Jane Addams and some of the other women receive, but that didn’t appear to be important to Smith. She gave back to communities she felt connected to and part of. Plus, she was Jane Addams’ right-hand woman. You can’t get any better than that!! Welcome to the first edition of our Meet the Staff series! Today you’ll meet our Exhibit Coordinator, Naomi, a talented new addition to the staff. What did we ever do without her?? I am the exhibition coordinator at the museum, so I get to manage the whole production of the exhibition that is slated to open a year from now. What are you currently working on for the new exhibit at Hull-House? Currently I’m trying to track down some interesting artifacts related to Grace and Edith Abbott, two sisters who spent about 10 years living and working at Hull-House. But I’m also working on about 7 or 8 other projects at the same time. I’m also spending a little time every day searching the collection database so I can get to know what we have tucked away in all our various storage areas. I like the fact that I get to work on several projects at once; some of it is intellectual and research-based and some of it is organizational and busy work. It’s a great mix. Even though I like how varied my role is at the museum, it can be a challenge to switch gears between busy work and research. And we have a very chatty and lively office (which I love!) but it can also make it that much harder to delve into the archives or get all that reading done. Another hard thing is having to nag people to get stuff done. No one likes to be a nag, but someone has to do it. priceless. It’s unfortunate that we can’t exhibit more of them. I’m a bit of a homebody, so I spend time there, cooking, hanging out with my husband, doing crossword puzzles, playing scrabble, and lots of reading. But we also go out and spend lots of time with family and friends… which usually involves eating. I don’t know yet, but I’m sure by the time this exhibit is installed I will.